People regularly whine about “ugly” anime, complaining that if a series is ugly, then it’s not worth watching. Natsume Ono‘s style is the finest modern example. Her latest work can be seen in the new House of Five Leaves (which began only last week on noitaminA,) but you may also know her as the creator of Ristorante Paradiso. For some people, though, that’s still too hard to accept. They refuse to understand why a series like House of Five Leaves is even being made, let alone why anyone would ever bother watching it, and that’s when the ‘p’ word starts getting thrown around, too. The ‘p’ word is obviously pretentious. Enjoying House of Five Leaves is pretentious because no one can honestly enjoy such ugliness, right? Pretentious has long since become a word within fandom used by a person to express aghast that another could ever truly enjoy something that he/she doesn’t. It’s no longer a matter of taste, but of pretention, we’re all merely deluding ourselves by enjoying such ugly, complicated and confusing stories. Yeah man, and Kaiba was suuuuuuuch a kiddy show! Is it ugly, really? I don’t think so. It’s different, definitely. It calls attention to the artificialness of the visual style, which is fine. Sometimes such contrasts result in highlighting other elements — such as interesting characters in this case. Would I appreciate this better if more traditional character designs (even for mature works) such as from Aoi Bungaku were used? Probably. However I won’t say it’s a huge problem if I don’t particularly feel compelled to put up wall scrolls in my room or office of character from this show. I wonder sometimes if anime character designs are actually as homogeneous as it seems. I suppose there is a generic contemporary design but I would be hard-pressed to convince myself what it is. Can I say that the character designs of these shows look alike? I don’t think so at all. Ono’s designs are strikingly different, but when HoFL is pressed to show an attractive young girl, as is the reason for the formation of the bandit gang — she isn’t very representative of the visual style of the rest of the show, and possibly a lot more similar to how young women would look like in other shows (excluding moeblobs). The character designs for all of the shows you’ve mentioned above are indeed different, but each are rooted within their respective genre or target demographic. For example, Gundam 00 has a bishonen aesthetic comparable to the likes of ‘Terra E,’ ‘Jyu-Oh-Sei’, etc, and whether it’s right or not, those designs represent a certain expectation and feeling for the viewer. HoFL doesn’t have that buffer; people don’t know what to expect from it and it needs some effort of their behalves to work it out (all of this is of course exasperated by the fact that HoFL looks to be a very slow building, contemplative piece). As for the younger woman, I suppose the point is that beauty actually has some value in Ono’s world: the other characters are slightly more rugged because they lack her kindness of spirit and enthusiasm? Probably the greatest strength of Ono’s character design is that she’s capable of conjuring a whole gamut of subtle human feeling through facial expression and body language. Compare the kind of complex characterisation seen here to, say, Lelouch of Code Geass. Good points throughout. We haven’t seen a whole lot of variety of facial expressions yet, have we? Wouldn’t you say that such strikingly different character designs would get in the way of dramatic changes in facial expressions? The contrast with ‘normalface’ would be greatly blurred because normalface is already so unfamiliar. Perhaps. I think all we can do really is just wait and see, even though both of Ono’s anime so far have been very laid-back affairs, meaning we probably won’t see much of any real dramatic changes of face anyway. Not aping everyone else’s art style is considered “pretentious” these days? What a serious case of intellectual rot.. I mean, isn’t it actually pretentious of *them* to feel entitled to dictate that everyone has to watch the same generic art style all the time? Talk about being stuck in your comfort zone..
Maybe the “problem” is that some people are shocked that when they’re forced to find the beauty in the characters in a less obvious manner? That’s too much work when they could just tune into K-On and see a bunch of round faces smiling at them for 22 minutes while eating cake.. They are not my favorite character designs but I wouldn’t say they are ugly. They are definitely more appealing to me than the big doe eyed characters from Key productions where every character practically looks the same. In my experience, the p-word sets up a lot of red flags about the person who throws it out. So many shows have been labeled pretentious, but very few of them really fit the bill. I guess it’s become the de facto term for something you *just* can’t get into, or understand? I’m with schneider. The P-word is like calling someone an elitist (the E-word!). And I don’t understand why people are so eager to reject something simply because they don’t fully understand it. But I guess they consider some anime, along with other works of art, to be something entertaining and nothing more. They don’t get it that learning to understand something can be as fun as watching, say, K-ON! !, which I’m also watching. As for me, ugliness in a series isn’t the issue. It’s when there’s something out of place and jarring that spoils the fun for me, like a sudden badly-drawn head or background. If it’s visually consistent I have no problem with it. But I must be pretentious. And elitist. Ono’s character designs are unconventional within an anime/manga context but it’s hilarious to think they’re could be called ugly when you look at how genuinely odd the anime/manga aesthetic is as a whole. Short of a few photorealistic artists, ALL of anime and manga have some pretty hideous design features if judged in a real world context. And this is where this criticism fails massively – they’re using a standardised notion of attractiveness from the real world to judge an animation/comic, conveniently ignoring the fact that their favourite show or book would also look pretty monstrous if seen irl. This is more an issue of ‘the norm’ and people’s knee-jerk reaction to deviations from it rather than any prescriptivist definite on what’s pretty and what’s not. And those jerking-knees belong to idiots. Personally, I struggled more with Ai Yazawa’s character designs in Nana, Paradise Kiss etc. than Ono’s. To me, initially, all her characters looked like freakish aliens with long, gnarled fingers and glaring bug eyes. I came to appreciate her style for the function it played in a broader sense (FASHION darrhling) and Ono’s designs work in the same way. She seems concerned more with the symbolism of her characters’ looks rather than an overall attractiveness. Yaichi, for instance, is very elongated and languishing in design and this accentuates his unhurried, ponderous personality. They work very well in visually suggesting character traits and general sensibilities, and personally I think they’re very attractive quite apart from that. It’s an issue of taste AND engaging with things we might find challenging. When I read the post title I kind of assumed the subject would be Old shows. Lots of them have a take on unrealistic, stylised faces which differs from current norms, and bad animation/ lack of detail thrown in too. Ugly isn’t bad at all of course, but ugliness can be a minor obstacle at times. I’d say House of Five Leaves is actively pretty, in much the same way a film with sub-glamorous stars can be far more attractive than your regular blockbuster if directed with some nous. If someone called HoFL pretentious I’d have assumed they were talking about it being style over substance (although, hopefully, that would be a premature complaint). I didn’t think House of Five Leaves was pretentious, at least not much if at all. But I find this post kind of pretentious. Because it’s defining the use of its style for being “original.” I’m sorry, but trying to be original by being different is patently pretentious. Do you really think that is why Ono draws like this? The art has to serve some kind of purpose, and so far I don’t see it at 1 episode. Maybe you can enlighten us as to why the art style is like this. Second, I took a bit of time and tried to “understand why a series like House of Five Leaves is even being made” and I got the answer “they’re trying to sell to a josei audience.” Which means people defending it on grounds of originality or something probably are reading too much into pulp fiction. I think if I was writing about pretentious anime, a title that is about a bunch of old guys selling pasta to pander to fujishi will fit right in. Maybe that’s not the case here but I can’t say anything about Sarai-ya Goyou since I haven’t seen/read enough of it. Ono draws like this because that’s her style, in the same way that Taiyō Matsumoto draws his manga in a very unique way, too. I don’t think they set out to draw their manga in an ‘original’ fashion, it’s just an abstract way for an artist to express her (and his, in Matsumoto’s case) feelings. The idea of it being ‘original’ comes from my perspective, in the sense that one can immediately tell an Ono or Matsumoto manga as soon as he sees it. They are clearly personal styles, different from everyone else’s, therefore, original. Valuing that I don’t think is pretentious at all. And I think it’s way too cold to look at noitaminA and point to the ‘josei’ demographic. They actively go out of their way to commission unique series, of which House of Five Leaves is one. There’s a certain amount of artistic freedom and creativity in their shows that are plainly absent from other late night anime, so, no, it is not all about demographics. noitaminA has its own audience; an audience that values ‘originality’. Besides, is there any commercial potential to be found in House of Five Leaves or Yojō-Han Shinwa Taikei? I would suggest that noitaminA produces these shows (like Trapeze, for another example) expecting to make a loss, instead banking on commercial juggernaut’s like Nodame Cantabile and Eden of the East. Well after 3 seasons of Nodame I think that’s pretty “bank.” No, noitaminA is the only other josei segment on air right now besides Noise (also a FTV program block), which is why it looks unique. Are they experimental? Sure, but it would be a mistake to overlook the commercial component of their selections (and as far as I can tell it is the one common thread among all their shows). (I mean I wouldn’t be arguing with you if you’re talking about Trapeze.) Seriously, did you take your own advice and think about why they’re animating this? I think it’s out of critical acclaim and popularity of the manga… which is no different than why any other thing gets adopted this day and age. Eden of the East is…a commercial juggernaut? LOL. Anyways, I think it’s pretentious to defend something like this by saying it’s original. Let the show do its own talking, and accept that it’s a show with a targeted audience (ie., not everyone will like it). My original point still stands, though. 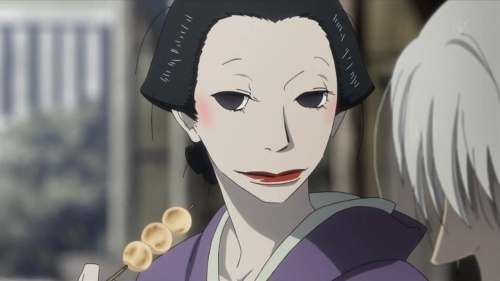 noitaminA will be banking on the likes of EotE, Nodame and the forthcoming live-action Moyashimon to bring in the money, while the likes of House of Five Leaves, Yojō-Han Shinwa Taikei and Trapeze are more about creating something different, commercial or not. noitaminA is Animation spelt backwards for good reason. 3) I will accept that this probably got commissioned because it’s from Natsume Ono, whose stock seems to be rising at the moment, but I would also argue that it’s being animated because it’s original-looking and manglobe think it’s a good story worth telling, and if you’re going to get hung-up on demographics, consider that House of Five Leaves is being serialised in the obscure seinen anthology IKKI, so, does that make House of Five Leaves seinen and josei at the same time? Why put something seinen in a josei timeslot? Anyway, I suspect we can go around and around in circles on this, especially without concrete sources on noitaminA’s so-called business decisions, but put it this way, if this makes money for them, I’ll happily admit you were right. If your point is about House of Five Leaves creating something different, you’ll have to cite me on this since the facts available does not indicate this being the case. 2. You’re wrong and the detractors are correct–it is actually a bad show (on 1 episode anyways). But no worries, Masaaki Yuasa’s up next and he’s always been a crowd pleaser!?! Yea, and I’m not sure if I’m surprised that Tatami Galaxy is so much more enjoyable to me than House of Five Leaves. But I think Yuasa settles any argument about noitanimA being experimental, lol. It makes House of Five Leaves look like a moe series. And, next week, we have Masaaki Yuasa’s new anime to look forward to, too. God(s) bless noitaminA! Indeed, critisising something just for trying to be different is what really annoys me at the start of every new season. It’s fair enough to not be interested in House of Five Leaves, but I wish they wouldn’t critisise it for such superficial reasons. Your latter paragraph contains a very good point, which, I think, is spot on. More than anything else, it’s just easier to write off art as “ugly” if that means not having to actually watch it and think about it. Totally. ‘Pretentious’ is now a word a person uses to deflect from their own failings. Therefore, when something like House of Five Leaves suddenly pops up and a lot of people seem to like it but this one person doesn’t, it’s immediately a pretentious anime and we’re all pretentious people watching it. The idea of having to give something to a series like this is what I think a lot of people don’t want to do. It’s like the way you described your feelings about Yazawa’s and Ono’s respective styles, which implies that you had to make the effort to contemplate the art and understand what it was trying to say. The keyword is effort, I guess. Totally agree with you. House of Five Leaves is only unattractive when looking at it from a very superficial point of view. Within the show itself, when actually watching it and venturing into Ono’s world, the art makes perfect sense. You’re not alone, Katie. There’s not enough of us, though. Every anime has its fair share of pretension, so bitching about something as trivial as that is downright silly. If anything, I appreciate an art style that looks different. When you watch and read a lot of manga and anime, it becomes a point of irritation to see lots of differents artists or animators churning out the same generic and formulaic crap you’ve seen a million times already. This is especially the case with anime. In fact, I don’t even see any remarkable difference between this and another ‘flavour of the month’ moe style series when both almost have the same artistic aesthetics if you disregard all the glitters and sparkles. It’s all in the nuance, and House of Five Leaves certainly doesn’t look ugly from a technical pont of view. This is a pretty late comment on my part, and I doubt many, if any, will see it, but formulating opinions I may as well write it down. The word “pretentious”, I think, may almost not come from most people’s appraisal of the show itself; that shows in how many seem to be making judgments on the screenshot itself. After watching a number of episodes, the pacing gives a sense to me that the show isn’t really going to be the palate of most people. House of the Five Leaves almost reminds me of K-On! in a way, though marketed towards two very different demographics. I’ll also give HotFL the benefit of the fact that it does set some sort of narrative backdrop (the flashbacks), but ultimately I think a lot of the entertainment comes from watching the characters going through the motions of interacting with each other as time goes on, and most of the kidnappings and the plot movements generally play backdrop to this, rather than being the focus. I digress though, as that isn’t the point I was getting at. Point is, this sort of show, as seen by how people generally hate on K-On! quite a bit (though obviously, it has a much more visible and easily scapegoatable aimed market than HotFL’s: the otaku), isn’t really the show most people are willing to go along with unless they already have something invested in the genre (whether it is moe fetishism or josei fetishism that is your cup of tea). Ristorante though, fits into this slot significantly better than Five Leaves does, which I do think does just that little bit more. Regardless, Five Leaves is not particularly a show that runs at you and sweeps you off your feet, and it certainly doesn’t do that leading with the first episode. It sort of requires the viewer to willingly submit themselves to it, since like other shows of its type, it doesn’t exert very much to try and hook people into the show (other than how the characters are presented, and thus what you could probably expect from it). So this leads to the fact of why most people won’t watch it; they think it’s boring. What’s familiar there? It’s precisely the same general reaction people have towards Lucky Star, K-On!, et al: all the universally slammed shows that people love to hate, yet still enjoy a healthy fanbase. Yet, we must recognize that there is something inherently different between the reactions. Due to josei shows being far less prominent (assuming you mainly rest in anime, not manga) in this field, than the moe giant of Japan, not only does it come to feel more original (while the moe aesthetic that has huge influence over much of the market, looks less so) but critics (bloggers, forum posters, etc.) are much more willing to give it a chance, to defend it, to say “No, this is different”, or argue that there *must* be some deeper, greater purpose behind it. And often, this group of people heavily, heavily overlaps with the group that also universally slams shows like K-On!, calls it boring or shallow, says it’s unwatchable, a moe sell out, and all those good things people love to say because hating on the moe blob genre is the acceptable protocol for most critics who fashion themselves to have “taste”. And coming full circle, it is thus that the idea of pretension is born. Not aimed at the show itself because the show itself is pretentious, but because through the show they are expressing their feeling that the critics themselves, are pretentious. I don’t necessarily subscribe to that idea exactly, but this is more or less why I think it ended up as it did. Certainly, refusing to watch a show because it is “ugly” is terrible reasoning and illogical. But ultimately, it stands precisely on the same platform as refusing to watch a show because “it looks moe”. And it’ll hardly help when people will go ahead and watch the first episode of a show, but with the sole mission of giving legitimacy to their hating it (rather than, y’know, the other way around). Which obviously, is entirely the worst way one could try to enjoy a show, particularly when one goes in with such a mine, they’ll forcibly appraise the show along a criteria that only really works if you’re watching a show of an entirely different genre (it’ll never work, if you try to watch K-On!, for example, if you’re going in to judge it along the same criteria as say, Evangelion). But probably the part that injures the community’s ability to get along, is that some people have been very vocal to denounce, bash, and slam a show under fairly unfair premises. This has just inevitably led to a big backlash, since the crowd that really *does* enjoy those kinds of show, as alien as the thought might sound or as damning as the theories as to why might be, have basically spent years watching under a fairly judgmental crowd. I’m totally ranting now, though. Whoops. That said, if someone does come across this post, any recommendation as to which fansub I should go for, with House of the Five Leaves? Commie, which was what I was following, seems to have fallen behind again. I like your opinions a lot.